In January, we held our Celebration of Life event that was moving and inspirational. It is especially gratifying for MPV when a young 20 year-old Muslim man confesses that he finally can identify with being Muslim, and when a mature woman of Muslim heritage announces that the event made her proud to be Muslim. Check out photos and the videos of our celebrity presenters and comedians on our YouTube Channel, including Los Angeles Mayor Eric Garcetti, Reza Aslan, Marianne Williamson, Elizabeth Espinosa, United Nations Special Rapporteurs Karima Bennoune and David Kaye, and keynote speaker Ensaf Haider (author and wife of jailed Saudi blogger Raif Badawi). 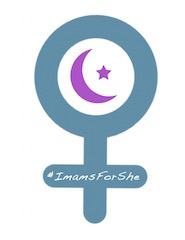 In February, MPV convened 30 progressive imams and scholars of Islam in Tunisia toward mobilizing a movement against the rise of misogynistic beliefs stemmed from the spread of political Islam and Daesh. Ani Zonneveld represented MPV at a strategy session of feminists from all over the world against religious intolerance, hate and radicalism. Regardless of religious beliefs, it is noted, the outcome is always the same - the marginalization of women, minorities and LGBT peoples. That said, we are excited about the upcoming strategies and activities to roll out in the near future. 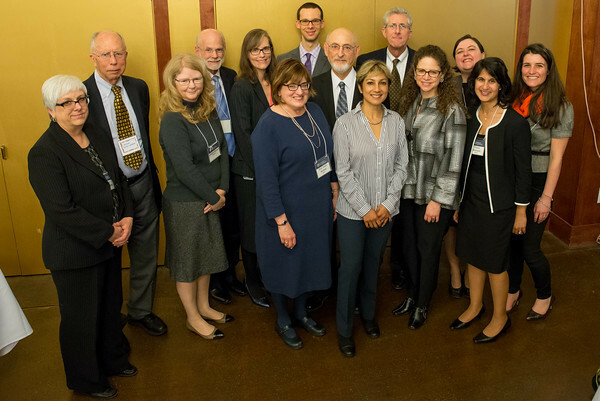 Ani Zonneveld spoke on the Winter Jewish-Muslim Panel at the Schwartz/Levi Inn of Court. The Inns of Court are a group of judges, attorneys, and law students whose goal is promoting ethics, civility, and professionalism in the practice of law. international human rights law and Shari’a. 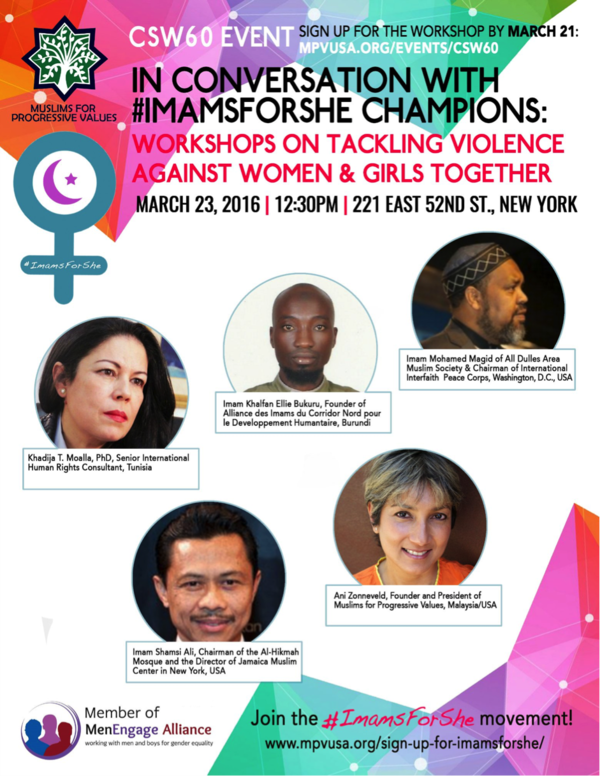 #ImamsForShe Champions include: Khadija Moalla (PhD, Senior International Human Rights Consultant, Tunisia), Imam Bukuru (Burundi), Imam Magid (Washington DC), Imam Shamsi Ali (NY & Indonesia) and moderated by Ani Zonneveld (MPV). 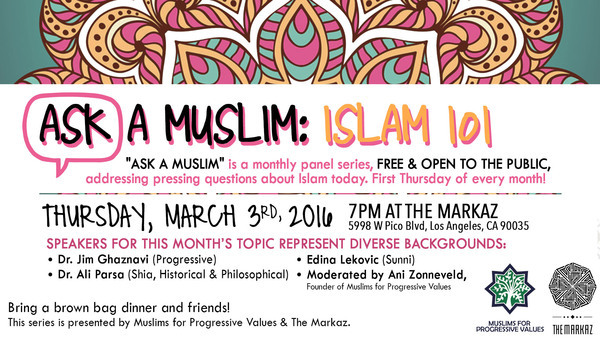 UPCOMING, THIS THURSDAY IN LOS ANGELES: "Ask A Muslim" is a new monthly series FREE & OPEN TO THE PUBLIC. This month's theme is ISLAM 101! This workshop seeks to engage the greater Los Angeles community across all religious, cultural and political boundaries, and to foster public conversation about the Qur’an and what constitutes a compassionate, egalitarian and peaceful practice in all its manifestations, with the intention to dispel simplistic or stereotypical interpretations and vilification of the Muslim religion. 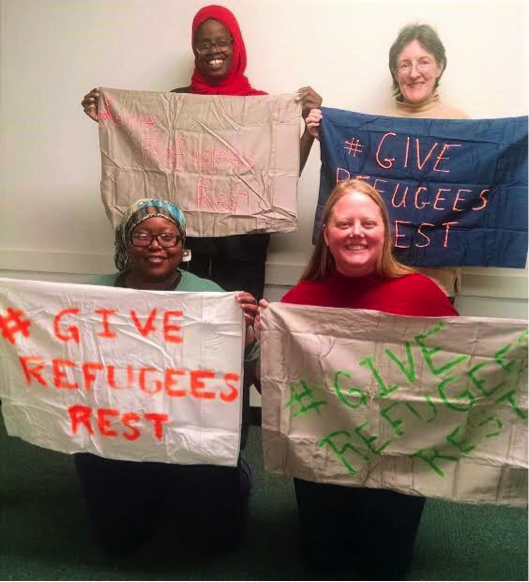 MPV-Atlanta participated in the #GiveRefugeesRest campaign to highlight how refugees should be welcomed to the State of Georgia. Trina Jackson delivers pillowcases from the #GiveRefugeesRest project to Governor Nathan Deal’s office. You can join MPV-Atlanta on Fridays at 1:30pm at the Phillip Rush Center (1603 Dekalb Ave, Atlanta, GA)! We also gather on Sundays for a Sufi zikr with local friend groups. Please email Kelly for more information. MPV-Chicago holds Friday prayers at Lake Street Church (607 Lake St., Evanston, IL). Contact Ahmed Karrar if you have any questions at akarrar01@gmail.com. MPV-Melbourne has a record 121 members as part of its group. We continue to run fortnightly Quran discussion clubs at the Ross House on Flinders Lane. MPV-Melbourne also had its first picnic on Saturday, February 6th (pictured below). MPV-Sydney has been working hard on the Muslims Against Homophobia campaign for the Sydney Mardi Gras. Muslims Against Homophobia plan to hire a professional darbuka player and have the maximum number of people (25) join us in the parade! Photos to come in the March newsletter. MPV-Brisbane was launched in February 2016. So far we have seven members and we are looking to grow into a thriving community. MPV Brisbane: events to be announced on Meetup page.